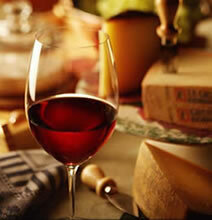 Puglia makes up the southeast part of the Italian peninsula. A land of contrasts and abundance, bathed by the Ionic and the Adriatic seas, Puglia offers tourists more than 800 km of coastline, surrounded by vast expanses of wheat fields, gardens, olive groves and vineyards, all flourishing under the glorious Mediterranean sun. Puglia has been inhabited from the depths of antiquity 3000 B.C., long before the rise of civilization. These ancient inhabitants left behind numerous testaments to their presence here. Inhabited first by the ancient populations of the Messapi and the Dauni, Puglia was home to the Greeks, the Romans, the Byzantines, the Normans, the Swabians, the French, and the Spanish, all of whom embellished this land with their own cities and monuments. From among the innumerable artistic treasures of Puglia, three elements of excellence stand out: its Romanesque cathedrals, the Swabian and Aragonese castles, and the Leccese Baroque. Covering the region from north to south on a virtual voyage, we first come upon the province of Foggia, with its Gargano Promontory: a long coast of breathtaking beauty, dotted with charming fishing villages turned tourist attractions like Vieste and Peschici. Gargano holds two notable treasures: Monte Sant'Angelo, an ancient 5th century town center dedicated to the worship of the Archangel Michael, and San Giovanni Rotondo, which attracts a million pilgrims every year. They come to venerate the most-loved of the modern saints: Pope Saint Pius X.
Bari, the capital city of Puglia, welcomes you with its extraordinary heritage of art, enclosed within the labyrinth of the streets of the old city. The most important of Bari's monuments is the basilica of Saint Nicolas, an outstanding example of Romanesque architecture which served as a model for many cathedrals in the region. Along the Bari coastline lie jewels such as Trani, Barletta and Molfetta, cities which prospered in medieval times through busy trade with the Orient. In the inner region of Puglia lies the territory of Murge, with vast wheat fields, olive groves, almond groves and vineyards, and where walled cities arise, encircling historical centers rich with Romanesque art: Bitonto, Ruvo di Puglia and Canosa. Rising up on a hill, solitary, it is one of the definitive symbols of Puglia: Castel del Monte, the most mysterious of the many castles built by Frederick II of Swabia. Continuing south, the traveler comes upon the magnificent Itria Valley. 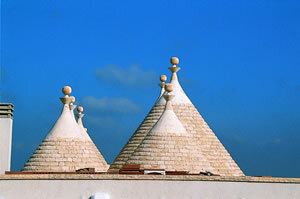 This is a fairy-tale landscape, populated by tens of thousands of "trulli", cone-shaped dwellings unique to this region, and unique in the world. 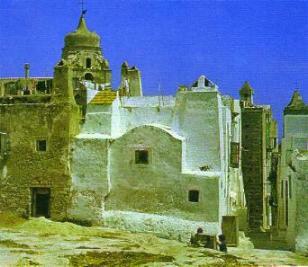 Most of these dwellings can be found at Alberobello and Locorotondo. But don't pass over Martina Franca, a fabulous maze of white alleyways, resplendent with excellent baroque architecture. Near the coast of Brindisi arises the white expanse of Ostuni, high on a ridge, looking out over an infinite green carpet of olive trees. Today a famous tourist center, it possesses an incredible heritage of baroque palaces nestled within a weave of white houses. Even further south, we find the ancient town of Lecce, often called "Florence of the South" for the incomparable beauty of its churches and monuments. From Lecce begins magical Salento, the heel of the boot of Italy, a remote area containing unique landscapes and traditions, and a unique and distinctive dialect, "Griko", a language very similar to ancient Greek. We start from the ancient city of Otranto, the easternmost city in Italy, protected by the powerful Aragonese castle and overlooking an emerald sea. On the Ionic Sea, we see Gallipoli, the Greek Kallipolis (beautiful city), constructed on an island and connected to the mainland by bridge. Another true pearl is Nard, with a piazza considered to be the most beautiful in Salento. The fifth major town in Puglia is Taranto, on the Ionic coast. Taranto was the most powerful of the ancient Greek colonies in Italy. The city is worth a visit for the National Archeological Museum, a rich collection of the ancient art of Magna Grecia. North of Taranto we find one of the most unusual landscapes in Italy: the ravines. These are canyons with limestone walls which since medieval times have provided shelter for dozens of rocky settlements. Today you can visit these homes and churches made of rock, festooned with ancient frescoes. The best-known city in this area is Massafra, but Laterza, Castellaneta and Ginosa are also spectacular. Puglia, with its 800 km of coastline, is a true paradise for lovers of the sea. 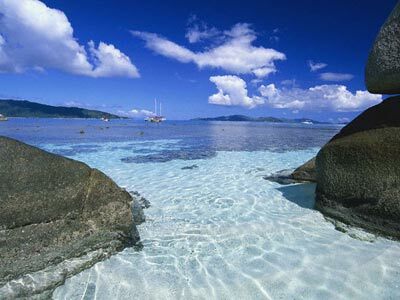 The coasts of the Adriatic sea are usually rocky, separated by inlets of white sand, while wide sandy beaches await you on the coasts of the Ionic. Gargano: to the north of Puglia lies Gargano, a massive karst straddling the sea and the plains, with white cliffs rising up out of a spectacular sea. Gargano is completely covered by a beautiful mantle of green, and from its center extends the lush Umbra Forest. The National Park of Gargano was established in 1991 to protect this environmental treasure. Off the coast of Gargano lies the Archipelago of Tremiti, three islands that offer tourists a pristine environment indeed, a backdrop for dreams. Murge: in the province of Bari we find the high plains of the Murge, a fascinating, scarcely habitable territory of vast plains and rough, severe landscapes. The National Park of Alta Murgia is being created to protect and preserve this unique landscape. 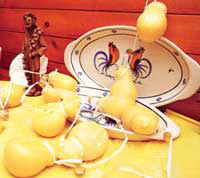 The karst terrain of the Murge is the birthplace of canyons, grottos, and dolinas: the most famous are the Castellana Caves, open every year to visitors. Salento: this peninsula, extending southeast between the Ionic and Adriatic, contains landscapes considered to be among the most beautiful in Italy. On the coast of the Adriatic sea, still free from excessive tourism, the visitor is rewarded with breathtaking scenery: cliffs overhanging the ocean, marine grottos and hidden inlets where one can enjoy the beauty of the sea. Descending from Lecce, we find gorgeous locales such as the Orso Tower, Otranto, Santa Cesarea, Castro, and on the extreme point of Salento, Marina di Leuca. On the Ionic sea, the coast is lower, and has sandy sections, but allows some lovely views of the Natural Park of Porto Selvaggio. Here the coast is denser with beach concessions and developments, sometimes to the point of chaotic overcrowding. The areas with best tourist facilities are Torre San Giovanni, Gallipoli and Porto Cesareo.